The past has a bearing on what Buderim is today and a number of donors have asked that their individual donation commemorates the life of someone special to them. These special people have often had a long-term connection to Buderim. Four Foundation Ambassadors, Barry Leigh, Bill Lavarack, Phil Illingworth and Merran Williams have volunteered to work with specific donors to breathe life into their stories. Please contact the Foundation if you would like to know more about the Gifts in Memory program. We invite you to read the fascinating Gifts in Memory stories written so far by clicking on the names in the list below. 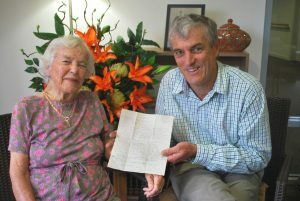 In 1943 a letter was written that changed Loloma Weir’s life. Over seventy years later, thanks to a good samaritan and the Buderim Foundation’s Gifts in Memory webpage it has travelled 1000kms to be returned.